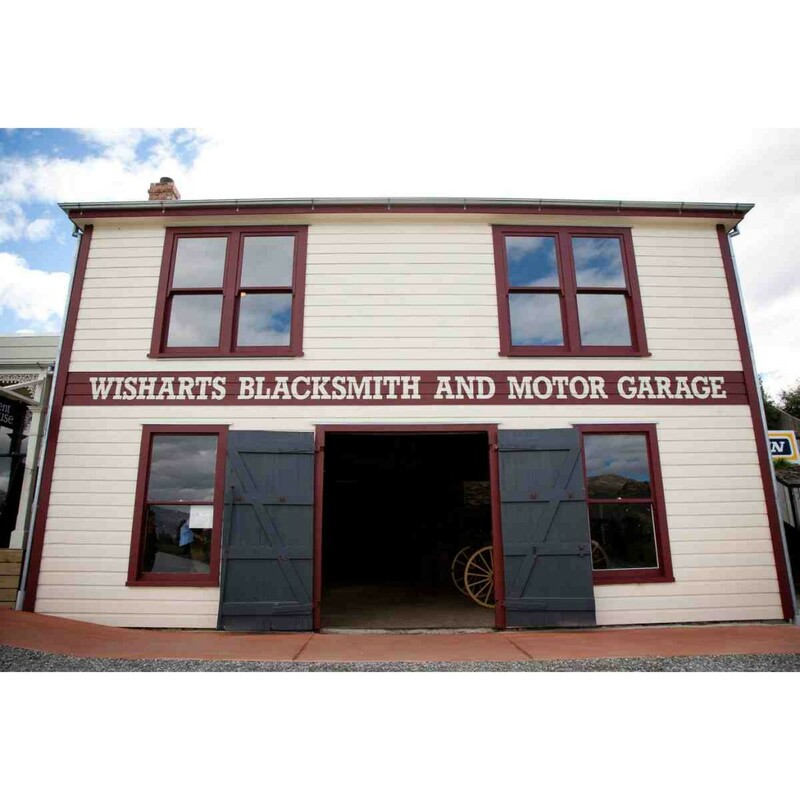 Wisharts Smithy is one of two buildings in the precinct on its original site. Robert Wishart came from Aberdeen to Cromwell in 1869 where he settled and took up employment with Edward Lindsay, the local blacksmith. Robert was 17 when he and his young wife set sail for New Zealand. Robert’s first wife died of tuberculosis on the voyage out to New Zealand and in 1877 he married Janet Lindsay. Robert prospered and bought out Edward Lindsay’s business, later selling it to James Richard. Business in the new town was booming and in 1880 Robert built his new blacksmith’s shop on this site with living quarters above. The new smithy was a two storey stone building with the forge and workshop on the ground floor. The upper storey of four rooms was used as the house and opened onto the top of the embankment. A later addition on this level was a corrugated iron building used as the kitchen. The smithy gained light to the back of the building from two skylights opening to the courtyard on the embankment. By 1917 Robert Wishart was advertising his services as a farrier, general blacksmith, machinist and ironmonger, as well as a specialist in dredge repairs. By 1928 he had installed an acetone welding plant and was also carrying out repairs on cars. In the early days, all the machinery in the forge was run by waterpower that came to the town through water races built by the miners. Later, when the council took over the management of the supply of water to the town, Robert objected to the cost of the water rate and a long running battle ensued. In 1909, due to a water shortage, he was permitted to use water for only a few hours a week, severely curtailing his business. Robert and Janet Wishart had ten children, although one died at birth and another died following a tragic toboggan accident in Melmore Terrace. Janet left Robert in later years. Robert died in 1945 at the age of 93 and the business was carried on by successive generations until it passed out of the family in 1970. A fire in 1992 destroyed most of the wooden interior of the building and the roof. The exterior “schist” stone walls survived, as did most of the huge iron framing beams. 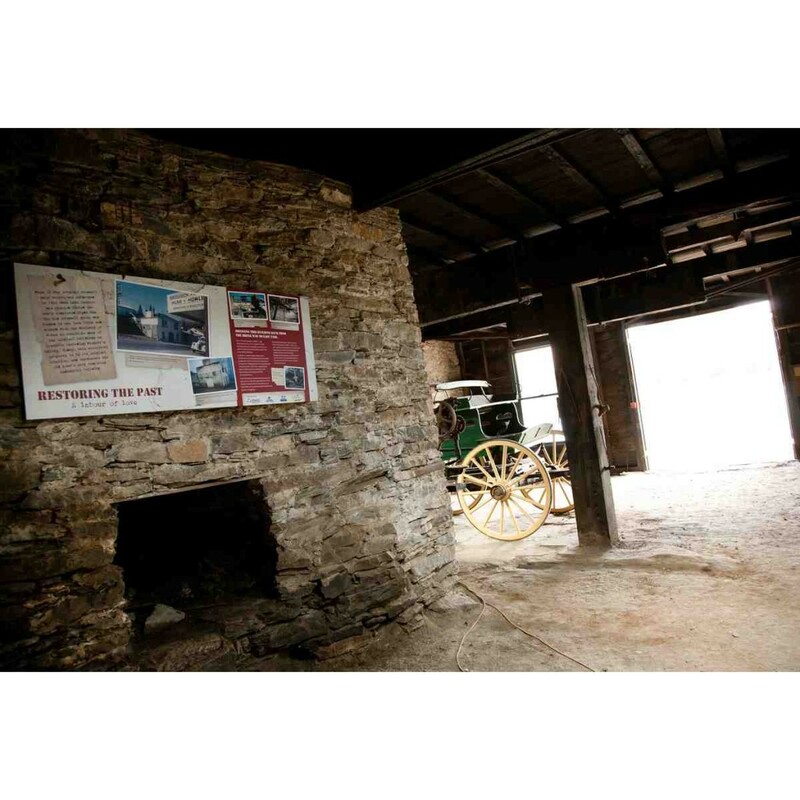 Many of the original metal structures, such as the metal rings for tethering horses remained intact and can still be seen in the walls.